1 of 6 In a small bowl, blend olive oil, vinegar, mustard, 1 teaspoon of the Greek seasoning and brown sugar. Reserve 3 tablespoons of the mixture. Place the remainder in a large resealable plastic bag. Add the steak and marinate in the refrigerator for one to 4 hours. 2 of 6 In a second small bowl, mix together the yogurt and feta; cover and refrigerate until ready to use. 3 of 6 Heat gas grill to medium-high or coals in charcoal grill to medium hot. Lightly coat grill rack with oil or cooking spray. 4 of 6 Brush tomatoes and onion with some of the reserved oil and wine mixture. Place tomatoes on grill, cut-side down along with onion slices. Grill for 3 minutes; turn, brush with remaining oil mixture and grill tomatoes for additional 2 minutes and onions for 3 minutes, until tender. Remove to a plate and keep warm. 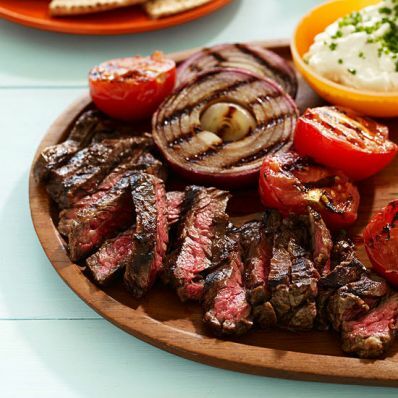 5 of 6 Remove steak from resealable bag and grill about 2 minutes per side or until internal temperature reaches 130 degrees F on an instant-read thermometer for medium-rare. Remove from grill and allow to stand 2 minutes before thinly slicing. 6 of 6 Serve pita slightly warmed and layer with lettuce, yogurt mixture and sliced steak. Accompany with grilled tomatoes and onion. Per Serving: 8 g sat. fat, 37 g pro., 48 g carb., 25 g Fat, total, 62 mg chol., 7 g fiber, 876 mg sodium, 555 kcal cal.